The animations are un-intimidating and hand-drawn. The lower case "i" is drawn with one pencil lift to dot the j. Uppercase "J" has 2 strokes or 1 pencil lift. 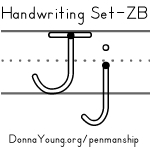 Note: Uppercase letter j will have the top (cap) on the worksheets below.